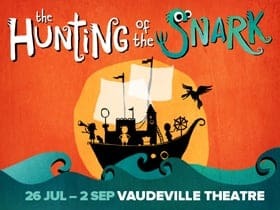 Callouh callay-ing into the Vaudeville Theatre this week is the West End summer run of a successful touring musical inspired by Lewis Carroll’s famous nonsense poem from 1874 ‘The Hunting of the Snark’. In this delightful family comedy musical, we join our intrepid team of five as they search for a Snark on aptly named Snark Island whilst being careful to beware the Boojum, the most dangerous variety of Snark there ever was. In a rather moralistic tale, we first meet a father (‘The Banker’ played by Simon Turner) who fails to build a relationship with his son (played by Jordan Leigh Harris) and who prefers and promotes the benefits of cash over braininess or kindness. Stranded on Snark Island where cash is merely paper, the father has a Damascene conversion when his son is snatched by the Bandersnatch and The Banker can’t pay anyone to help him. The Bandersnatch is played by Will Bryant whose enjoyment at playing the sly, slightly camp thief is clear to see. He seems to glide across the stage in glee. His outfit is a remarkable psychedelic number – metallic leggings, extravagantly ruffled top and sparkling top hat. Towards the end of the show, the Bandersnatch has a memorable song and dance routine in which he is joined by the rest of the cast as backing singers dressed in Liberace-style capes of black sequins and fur – “I borrowed these from Cumberbatch,” he quips of his near namesake Benedict. Designer Justin Nardella must have had a lot of fun working on this show. The costumes are fantastically flamboyant and Nardella makes excellent use of the naturally limited scope of the props and scenery of a touring production. The cast of five (or six if you include the remarkable knitting Beaver puppet ably operated by several cast members) is a polished and cohesive company. Polly Smith terrifies as the manic, demented ‘Butcher’ but the stand-out performance and the one you’ll remember long after the curtain has fallen comes from Ben Galpin who seems completely at home on the West End stage. Galpin’s portrayal of the flamboyant adventurer ‘The Bellman’ is utterly convincing, entertaining and energetic. In his second guise, he also appears as Jub Jub, an oversized bird who has much of the Rod Hull Emu about him. Galpin shimmies a wacky artificial grass skirt costume with great aplomb! Remember his name. He is most definitely one to watch out for. This show is completely charming and delightful – very light audience participation (phew), heaps of family fun, and the goodies triumph in the end. If you’ve got a little one at home be sure to catch this summer’s West End run or the extensive tour over the Autumn. Enter the imaginative world of Alice in Wonderland creator, Lewis Carroll, in this brand new, highly original, ultra – modern adaptation inspired by his much loved classic poem. 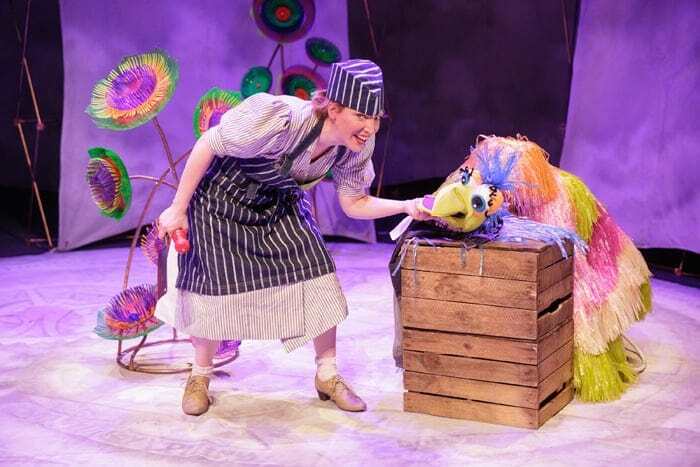 Fresh from London’s West End, this show features five high – energy actors, life – like puppets, fantastical characters, and lashings of daft humour. A riotous ragtag gang of bold adventurers including the Boy, the Banker, the Butcher, the Baker, the Bellman and the knitting Beaver set off on a quest to catch the mythical Snark… on the journey they encounter the Jub Jub bird, the sly Bandersnatch and the dastardly Boojum…Can a Snark be caught with soap? Will the Beaver escape the hungry Butcher’s clutches? Will the Baker remember his name? Does anyone know what a Snark actually looks like? Side – splittingly funny, joyful, fast-paced and bursting with a soundtrack of witty songs by an award – winning songwriter, The Hunting of the Snark is a tour de force that’ll delight, excite and entertain. This is a theatrical event that is one of pure joy. I haven’t laughed so much in a long time at the theatre. The kids were giggling and participating and the adults, including myself, were in stitches. I’m even thinking of going again. I hope it continues to bring joy to all for a long time yet.